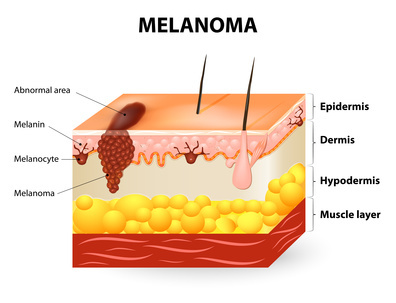 I have written several blogs making this melanoma case: not only is this deadly cancer not caused by sun exposure, but habitual, or regular, sun exposure has a protective effect against the disease. This blog will serve to reinforce and review the reasoning behind those conclusions. The increase in melanoma is mostly seen for the thin types, which can’t be attributed to sun exposure but to increasing screening over the last 20 years. The fact is, that incidence appears to increase as the number of dermatologists and public health campaigns also increase. But the increase in melanoma is not real. This idea is perfectly plausible; when more dermatologists are available, and the public is driven to them by health campaigns more melanomas are found. Many “first-stage” or thin “thin” melanomas are discovered and counted that would not have been found in previous decades. This causes numbers to be highly inflated compared to the days when there were fewer dermatologists and fewer public health campaigns. Comment: Another fact was not mentioned in the paper: Stunningly, a worldwide study of melanoma diagnosis and accuracy, published in the American Academy of Dermatology (AAD) showed that most diagnoses were incorrect. Approximately 44 different authors from many different clinics and countries, including the US, contributed to the report. They made an accuracy-in-detection analysis based on the actual number of melanomas that were excised during a period of ten years, compared with the number that really needed to be excised. Many clinics in different countries were involved in assessing the numbers. The AAD research showed that only about 3.5% of diagnoses in non-specialized clinics, and 14.7% in specialized clinics, resulted in actually being melanoma. From this information, it is evident that many melanoma surgeries are bogus and may inflate the incidence of this deadly skin cacner. What do we take away from this? There may be no real increase in melanoma, only an increase in assessment and excision. Low vitamin D levels are common in melanoma patients and have a deleterious effect on their risk and survival. Comment: Low vitamin D levels are caused by sunlight deprivation; we are told to avoid the sun, but sun avoidance leads to vitamin D deficiency, which further leads to melanoma. If our population regularly enjoyed non-burning sun exposure, vitamin D levels would be much higher and the risk of melanoma much lower. This is corroborated by the fact that people who habitually work outdoors have a far lower risk of the disease. Dr. Cedric Garland and his colleagues showed that those who worked indoors had a 50% greater risk of than those who worked both indoors and outdoors. An excess of naevi (moles), not sun exposure, is the strongest risk factor for melanoma, and when comparing the risk created by sunburns and fair skin to the risk created by an excess of moles, the moles create a 15-30 times higher risk. Comment: Some very important research by Dr. Adele Green found that the strongest risk factor for both limb melanoma and trunk melanoma was the presence of more than 10 moles on the arm, which predicted a 42-times increased risk. This means that public health campaigns should promote mole awareness! Unfortunately, they promote sun avoidance, which increases the risk of melanoma. Attempts to decrease melanoma incidence and mortality, by reducing sun exposure, has not been proven to work and may be harmful. Comment: the statement is obviously true. In the U.S., Sun exposure has decreased by about 90% since 1935. During that same period, melanoma has increased by 3,000%. Data from the Bureau of Labor statistics showed that indoor occupations such as “professional, managerial, clerical, sales, and service workers (except private household service workers) grew from one-quarter to three-quarters of total employment between 1910 and 2000.” The BLS also stated, during the same period, the outdoor occupation of farming declined by 96% from 33% to 1.2% of total employment. The data also show approximately 66% of the decline in the occupation of farmers and 50% of the decline in the occupation of farm laborers occurred after 1935. Further information, this time from the Environmental Protection Agency (EPA) determined as of 1986, about 5 percent of adult men worked mostly outside, and about 10 percent worked outside part of the time. The proportion of women who worked outside was thought to be even lower. These data demonstrate a dramatic shift from outdoor, sun-exposed activity to indoor, non-sun-exposed activity during the mid-to-late 20th Century. This change, nonetheless, has been accompanied by a 30-times increase in risk since 1935, the MIF-baseline year. Photoageing, which is skin ageing due to sunlight exposure, is not greater in melanoma patients than patients who do not have the disease. In fact, patients with the cancer exhibit less photoageing than those who do not have the disease. Comment: This was a new research for me and it belied the idea that sun exposure caused melanoma. If sun exposure causes skin photoageing, and there is less photoageing on cancer sites, sun exposure cannot possibly be causing melanoma. Enough said. We need our sunshine, and one of the reasons for that need is to prevent deadly cancers. Bataille V. Melanoma. Shall we move away from the sun and focus more on embryogenesis, body weight and longevity? Medical Hypotheses 81 (2013) 846–850. Argenziano G, Cerroni L, Zalaudek I, Staibano S, Hofmann-Wellenhof R, et al. Accuracy in melanoma detection: a 10-year multicenter survey.J Am Acad Dermatol. 2012 Jul;67(1):54-9. Garland FC, White MR, Garland CF, Shaw E, Gorham ED. Occupational sunlight exposure and melanoma in the U.S. Navy. Arch Environ Health. 1990 Sep-Oct;45(5):261-7. Green AC, Siskind V. Risk factors for limb melanomas compared with trunk melanomas in Queensland. Melanoma Res. 2012 Feb;22(1):86-91.